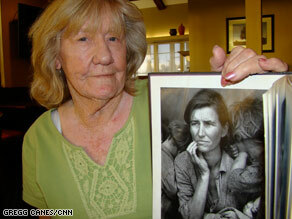 McIntosh says her mom, Florence Owens Thompson, was "backbone of our family"
MODESTO, California (CNN) -- The photograph became an icon of the Great Depression: a migrant mother with her children burying their faces in her shoulder. Katherine McIntosh was 4 years old when the photo was snapped. She said it brought shame -- and determination -- to her family. Katherine McIntosh holds the photograph taken with her mother in 1936. "I wanted to make sure I never lived like that again," says McIntosh, who turns 77 on Saturday. "We all worked hard and we all had good jobs and we all stayed with it. When we got a home, we stayed with it." McIntosh is the girl to the left of her mother when you look at the photograph. The picture is best known as "Migrant Mother," a black-and-white photo taken in February or March 1936 by Dorothea Lange of Florence Owens Thompson, then 32, and her children. "She asked my mother if she could take her picture -- that ... her name would never be published, but it was to help the people in the plight that we were all in, the hard times," McIntosh says. The next morning, the photo was printed in a local paper, but by then the family had already moved on to another farm, McIntosh says. "The picture came out in the paper to show the people what hard times was. People was starving in that camp. There was no food," she says. "We were ashamed of it. We didn't want no one to know who we were." The photograph helped define the Great Depression, yet McIntosh says her mom didn't let it define her, although the picture "was always talked about in our family." "It always stayed with her. She always wanted a better life, you know." Her mother, she says, was a "very strong lady" who liked to have a good time and listen to music, especially the yodeler named Montana Slim. She laughs when she recalls her brothers bringing home a skinny greyhound pooch. "Mom, Montana Slim is outside," they said. iReport.com: Are you worried about losing your job? Thompson rushed outside. The boys chuckled. They had named the dog after her favorite musician. "She was the backbone of our family," McIntosh says of her mom. "We never had a lot, but she always made sure we had something. She didn't eat sometimes, but she made sure us children ate. That's one thing she did do." Her memories of her youth are filled with about 50 percent good times, 50 percent hard times. It was nearly impossible to get an education. Children worked the fields with their parents. As soon as they'd get settled at a school, it was time to pick up and move again. They lived in tents or in a car. Local kids would tease them, telling them to clean up and bathe. "They'd tell you, 'Go home and take a bath.' You couldn't very well take a bath when you're out in a car [with] nowhere to go." She adds, "We'd go home and cry." McIntosh now cleans homes in the Modesto, California, area. She's proud of the living she's been able to make -- that she has a roof over her head and has been able to maintain a job all these years. She says her obsession to keep things clean started in her youth when her chore was to keep the family tent clean. There were two white sheets that she cleaned each day. "Even today, when it comes to cleaning, I make sure things are clean. I can't stand dirty things," she says with a laugh. With the nation sinking into tough economic times and analysts saying the current economic crisis is the worst since the Great Depression, McIntosh says if there's a lesson to be learned from her experience it is to save your money and don't overextend yourself. iReport: Are you worried about losing your job? "People live from paycheck to paycheck, even people making good money," she says. "Do your best to make sure it doesn't happen again. Elect the people you think is going to do you good." Her message for President-elect Barack Obama is simple: "Think of the middle-class people." She says she'll never forget the lessons of her hard-working mother, who died at the age of 80 in 1983. Her gravestone says: "Migrant Mother: A Legend of the strength of American motherhood." "She was very strict, but very loving and caring. She cared for us all," McIntosh says.